NOTTINGHAM, England (AP) England extended its own record in one-day international cricket by 37 runs after smashing the highest-ever total of 481-6 as it beat Australia by 242 runs in the third ODI on Tuesday. Australia was bowled out for 239 with 13 overs to spare – its biggest ODI defeat in terms of runs and England’s largest ODI win. England now has an insurmountable 3-0 lead in the five-match series. No. 3 Alex Hales hit 16 fours and five sixes in reaching 147 off 92 balls, and opener Jonny Bairstow scored 139 – also off 92 deliveries – in his fourth ODI century in the last six games as England went on a run rampage from the onset. England held the previous innings record when it scored 444-3 against Pakistan in 2016 at the same Trent Bridge ground. Australia, which won the toss and chose to field, never looked like reaching the huge target as spinners Adil Rashid (4-47) and Moeen Ali (3-28) shared seven wickets between them. ”Certainly a day for everyone in that changing room to be very proud of,” England captain Eoin Morgan said. Australia’s previous heaviest ODI defeat was 32 years ago when it was beaten by New Zealand by 206 runs at Adelaide in 1986. Australian captain Tim Paine’s decision to bowl first backfired spectacularly against England’s top-order batsmen. Seamer Andrew Tye finished on 0-100 off nine overs while the other two fast bowlers – Marcus Stoinis (0-85) and Billy Stanlake (0-74) – also went for plenty. Bairstow’s opening partner, Jason Roy, hammered 82 and missed out on a second successive century before Morgan hit England’s quickest ODI half-century off only 21 balls, and 67 off 30 deliveries. 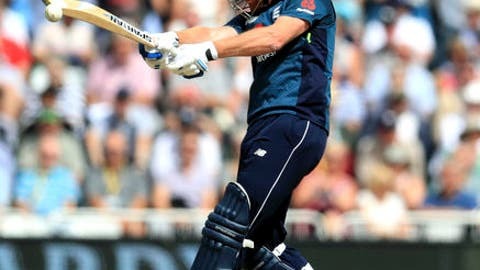 Morgan, playing in his 180th ODI, became England’s all-time leading scorer in the 50-over format with 5,443 runs as he surpassed Ian Bell’s 5,416 runs. Australia had its chances early on. Bairstow successfully overturned an lbw decision through television referral on 27 and then, on 30, Stoinis couldn’t hold onto a difficult chance while running back at mid-on.